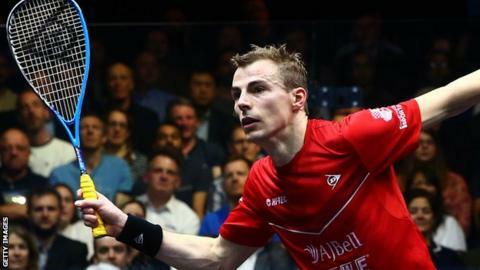 England's Nick Matthew and Wales' Tesni Evans have both been knocked out of the World Squash Championships after losing in the quarter-finals in Manchester. British number one Matthew, the fifth seed, lost 7-11 6-11 11-5 6-11 to third seed Mohamed ElShorbagy of Egypt. Matthew, 37, a three-time champion, was playing in his final worlds, having announced he will retire from the sport after the Commonwealth Games in April. Evans, 25, lost her match 9-11 7-11 9-11 to Egyptian Nour El Tayeb. "It's disappointing to go out in the quarters," said Matthew. "But I'm proud of my performance and if I keep playing like that, then a Commonwealth Games title is a realistic target and I'll end this tournament with good memories of how I fought back." Elsewhere, Egypt's top women's seed Nour El Sherbini beat compatriot Nouran Gohar 11-7 11-3 11-4 to reach the semi-finals, while in the men's draw French top seed Gregory Gaultier beat New Zealand's Paul Coll 11-6 11-5 11-4 to reach the last four.